There are 2 groups of settlements that is actually within the same area of 'tribe village/desa adat'. It is close to Sawah Lunto (another TWHS) so one can visit both in 1 go. The villages consists of many traditional houses that's very well preserved. They're still in use for real. I happen to visit one of the houses and see the making of their traditional cloth. A 2 hrs visit is already OK to see all. I should say that the culture of the tribe in Tana Toraja is really amazing. And that includes the outstanding story and value on their burial sites. I was amazed that this settlement is not inscribed yet. It is a 7 hrs trip by night bus from Makassar, South Sulawesi (nearest airport), but really worth it. Highly recommended and a must. 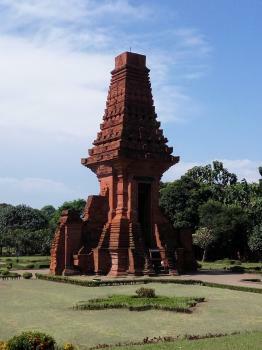 The scattered sites are located in the town of Mojokerto, around 1.5 hrs drive from the city of Surabaya (East Java). Once could start from the Museum, to get the basic idea of the history of the Kingdom. Being a huge fan of Indonesian History, these well preserved sites, on top of a good background from the museum guide, really worth the visit. It is an easy full day trip from Surabaya.